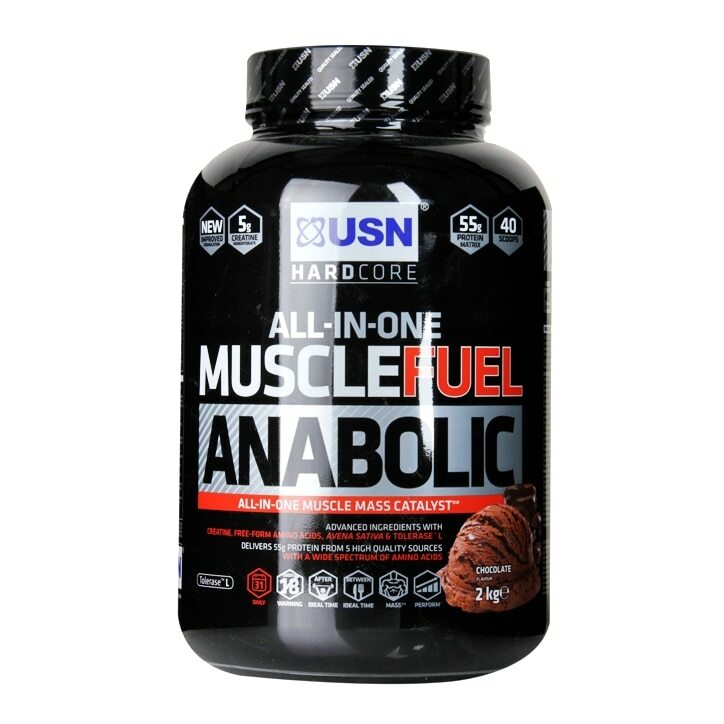 USN Muscle Fuel Anabolic is a scientifically engineered muscle building MRP supplement, formulated for athletes that are serious about building muscle mass. Add 3 scoops to 500-600ml of cold water, then use a blender or hand held shaker for 30 seconds to make a great tasting chocolate shake with 53g of protein and 5g creatine. Have one or two servings daily (servings may be halved). Carb Matrix (Maltodextrin, Dextrose monohydrate, Fructose), Protein Matrix [Whey protein concentrate (Milk), Soya protein isolate, Milk protein isolate, Egg albumen, Calcium caseinate (Milk)], Cocoa powder, Creatine monohydrate, Flavouring, Thickeners (Guar gum, Xanthan gum), Starch, L-Glycine, Shortening Powder [Palm Oil, Whey (Milk), Milk Protein, Stabiliser (Sodium Tripolyphosphate), Anti-caking agent (Silicon Dioxide), Antioxidant (Tocopherol)], Calcium beta-hydroxy beta-methyl butyrate, Beta-alanine, Branched Chain Amino Acid (BCAA) powder 2:1:1, Tri-calcium phosphate, Magnesium lactate, Tri-potassium citrate, Stabiliser (Cellulose gum), Sodium chloride, Taurine, Sweeteners (Sucralose, Acesulfame-K), L-Glutamine, Avena Sativa [Oats (gluten)], Vitamin blend (Ascorbic acid, Pteroyl-l-glutamate, D-alpha tocopherol, Nicotinamide, D-calcium pantothenate, Riboflavin, Pyridoxine hydrochloride, Thiamin hydrochloride, Retinyl palmitate, Methylcobalamine, Biotin, Cholecalciferol), Glutamine Peptide [Wheat (gluten)], Anti-caking agent (Silicon dioxide), Zinc bisglycinate, Tolerase™ L (pH-stable lactase). USN Muscle Fuel Anabolic Chocolate is rated 4.4 out of 5 by 32. Rated 1 out of 5 by virolite from Not a good product I am honestly writing this don't waste your time and money it tastes very artificial and not chocolate, irritates my throat and will give stomach pain unless taken on empty stomach.